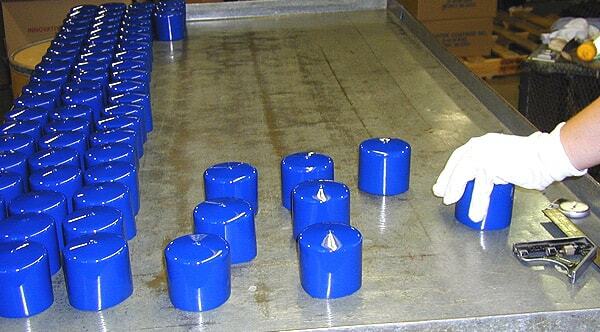 Vinyl Coating – Texas Dip Molding & Coating, Inc. In addition, vinyl coatings improve the aesthetic properties of substrates with an unlimited color selection. Industries that benefit from plastic coatings include medical, electronics, aerospace, automotive, food processing, sporting goods, construction and chemical processing. s a result of their flexibility and high abrasion resistance, vinyl coatings are utilized for a wide range of applications such as hand grips for tools, deep fry racks, wheelchair rims, hangers, playground equipment, outdoor furniture, steering controls and electrical insulation covers. The two most common vinyl compounds used in vinyl dip coating processes include plastisols and PVC. Plastisol is a vinyl compound which is liquid at room temperature and solidifies permanently when heated. PVC stands for polyvinyl chloride and is an organic polymer formed by treating vinyl chloride monomers with peroxide, creating extra-strength and resilience. Additional vinyl compounds include polyvinyl acetate, polyvinyl alcohol and acrylic compounds. A vinyl coating is formed during the dip coating process, also referred to as immersion coating. Dip coating is the full or partial immersion of a substrate into a tank containing a liquid vinyl coating material, removing the piece from the tank, and allowing it to drain. The process is three steps: immersion, dwell time and withdrawal. During immersion stage, the substrate, or part, is immersed in the liquid vinyl compound at a constant speed. In the dwelling stage, the substrate stays motionless and fully immersed in order for the liquid to gel and apply to the substrate. Lastly, in the withdrawal stage the substrate is removed, again at a constant speed. How quickly the substrate is removed from the tank determines the thickness of the vinyl coating applied to the board. There are two types of dip coating processes: hot dip coating and cold dip coating. The hot dip coating process is the most common and is used for almost all polymer coating applications. 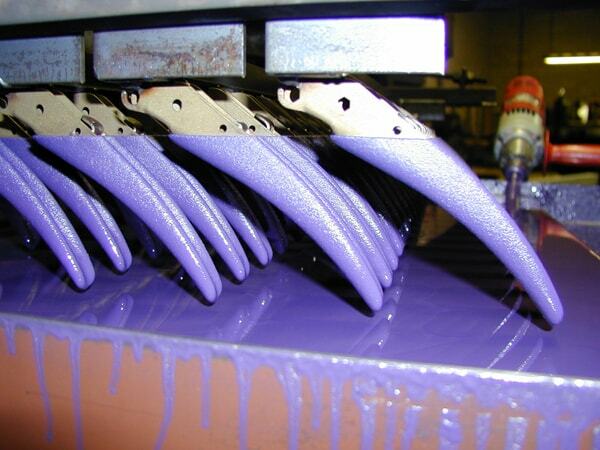 During this process the vinyl compound is kept in a liquid state while heated and primed substrates are dipped into the compound from an overhanging rack. The vinyl on the substrate is then placed in a heated chamber and heat-treated for final fusion. Cold dip coating process is used mostly for thin coatings of vinyl and is much less common. The difference between hot dip coating and cold dip coating is that in cold dip coating the object is dipped in a liquid vinyl compound without preheating. Vinyl Coating Vinyl coatings are the result of a dip molding process which forms protective and wear resistant smooth or textured coatings over substrate surfaces, typically metals. Offering superior physical properties, vinyl coatings have a high corrosion resistance, good chemical and electrical properties and excellent stability.